When I have tonnes of turkey leftovers after any holiday one of my favourite recipes to make is this creamy Turkey Pot Pie with a vibrant Cranberry topping. I don’t know many people who are able to eat an entire turkey at one dinner sitting which means turkey leftovers are either transformed or put in the freezer until it’s needed. If you’re anything like me and just cooked a large turkey for Christmas, finding new ways of using up the turkey leftovers is a must. I love to find ways to use my leftover turkey which includes such under-used ingredients such as homemade jams, jellies and chutney which are delicious. In the past I have transformed leftover turkey into turkey turnovers, teriyaki turkey chunks, turkey chili, turkey curry, turkey soup and even turkey and pumpkin lasagna. My plan was to use the turkey leftovers and the cranberry sauce that’s been sitting in the refrigerator since Christmas dinner to make an all-in-one pot pie. Today I am going to show you how to make my buttery, flakey, Turkey Pot Pie mixed with a gorgeous bechamel sauce and topped with a delicious homemade Cranberry sauce. Once you let the turkey pot pie cool after baking to a golden brown you will find it easier to slice. Creating a homemade Turkey Pot Pie is fairly simple especially if you have a no-fail pie crust that always seems to work perfectly, which I do. If you’re not a fan of making homemade pastry crust you could always buy it but honestly it’s so easy you’ll wonder why you were so worried in the first place. You can serve a generous slice of the Turkey Pot Pie with Cranberry Topping with a side mixed greens salad for lunch or add some mashed potatoes to have a complete dinner. Alternatively if you must have homemade gravy to top your Turkey Pot Pie go ahead and smother some on. If you don’t have leftover turkey because you didn’t cook one you could always substitute ground turkey instead. The texture will be different but the flavours will still be the same. 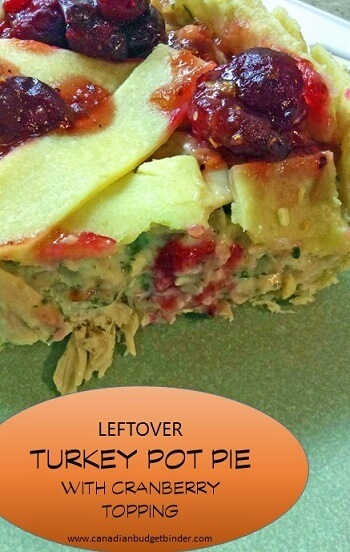 If you love turkey pie or have lots of leftover turkey to use up you'll want to make this easy turkey pie with a delicious cranberry topping. Make the béchamel sauce and mix in the parsley and chopped turkey. Let cool slightly. Roll out two thirds of the pastry onto a floured surface and this will line a 7" spring form tin. Once finished spoon the turkey mixture into the tin pressing it down with the back of the spoon. Roll out the rest of the dough and cut into strips. These will form the pattern on top of the pie. Brush the underside of the strips with water then lay over the top of the turkey filling. Place the cranberries and 4 tablespoons water in a pan, cover and bring to the boil. In another pan add the cranberry jelly, orange juice and zest and heat slowly stirring until the jelly has dissolved. Spoon a few cranberries into the space between each lattice on the pie, then spoon the cooled cranberry jelly over the top. That my friends is the way you can take turkey and cranberry sauce and transform it to make this Leftover Turkey Pot Pie which is fitting for any dinner or lunch party. I have about 4 bags of stock ready for whenever too! Your welcome Christine. I want pics if you make it your way lol. I have my leftover turkey packed in bags in the freezer along with 4 containers of turkey stock. I could easily use the stock to make a gravy for this in place of the sauce, add a load of leftover or frozen veggies and feed the four of us a nice meal. I always make sure I have cranberries in the freezer too for making sauce anytime. Quick and easy meal here!!! Thanks Nicola! !